Multi-platinum producer Drumma Boy is the man behind chart-topping smash hits like Jeezy’s “I Put On,” Migos’ “Look At My Dab,” Plies feat. T-Pain “Shawty,” and Waka Flocka Flame’s “No Hands” feat. Roscoe and Wale just to name a few. Recently, Drumma garnered his first R&B record to go platinum with August Alsina’s “No Love” featuring Nicki Minaj and continues to work with the “who’s who” of music including Usher, Gucci Mane, Young Jeezy, 2Chainz, T.I., Kanye West, T-Pain, Lil Wayne, Drake, August Alsina, Chris Brown and Wiz Khalifa amongst others. Monster Inc. is an American company that manufactures and markets 6,000 different products, but is best known for audio and video cables. It also produces speakers, headphones, power strips, mobile accessories and audio devices for automobiles. Over the years it created new divisions like Monster Music, Monster Game, Monster Mobile, Monster Photo and Monster Power. It began manufacturing headphones in a partnership with Dr. Dre in 2008, which ended in 2012, and it created other celebrity branded or Monster-branded headphone products. Athletes work out and real trappers trap! We all in our Trap, only the Trappalympics will succeed! One thing for certain, only you can get you fortune, so take control and join the Trappalympics! 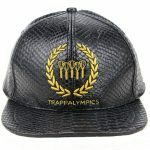 Order your Trappalympics hat ->here<-. You are a trendsetter, premium quality and fabrication is important to you. Then you might be interested in the headgear Collection.